Sometimes we see patients who, due to a variety of reasons, have lost most of their teeth. Estimates are that there are 35 million edentulous persons in the United States. In the past, these individuals would often be presented with the option to extract the remaining teeth and have dentures made. The problem with this is that dentures are known for feeling insecure and can make normal eating habits uncomfortable and embarrassing. An alternative could be to place dental implants for each of the missing teeth, but this is often a cost-prohibitive solution. However, using strategically placed implants to support a hybrid denture can be the perfect, middle-of-the-road option. An implant-supported denture is one that is supported by dental implants placed beneath the gum line. They are also referred to as “overdentures”. The minimum number of implants is four, although more implants can be beneficial. After placing implants, the body will need some time to naturally fuse with the jaw bone, a process called “osseointegration”. A titanium or gold bar is then placed to hold the prosthetic teeth in place. This system creates a much more secure prosthetic than a denture that simply rests on the gums and will not slip around. The denture is then fixed in place by Dr. Kivel. It is not removable by the patient like typical dentures. The most commonly reported benefit of a hybrid implant denture is the ability to eat, smile and speak with complete comfort and confidence again. It also comes at a significantly lower cost than a large number of implants. Lastly, the implant denture is easily cleaned, close to your natural teeth. You don’t have to take it out every time you want to brush - just keep up your normal hygiene habits. 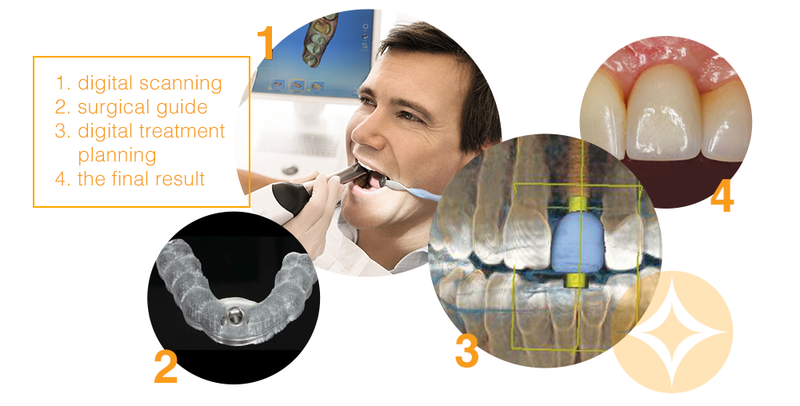 We are proud to offer a digital process for dental implant process in conjunction with specialists around the Rogue Valley. Below is a quick overview. Most patients who have lost an entire arch of teeth are eligible for hybrid implant dentures. One consideration is that the patient must be in reasonable good oral and overall health. The only way to confirm this, of course, is to book a free consultation appointment with Dr. Kivel at our Ashland, OR office. We can’t wait to help create a stable, secure, and complete smile! There is another option to have implant retained dentures. In this option, the gums still absorb most of the force of the bite and the implants simple help retain the prosthetic. These type of dentures are removable . We find that many patients dislike the thought of having removable teeth, because it is a constant reminder of their tooth loss and feel comforted waking up with teeth in their mouth. For this reason, we typically lean towards a fully supported, more permanent option.